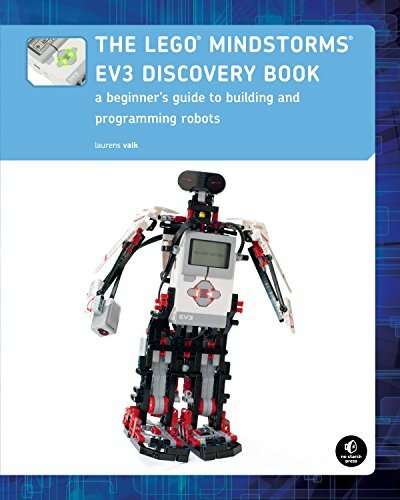 [PDF] The LEGO MINDSTORMS EV3 Discovery Book: A Beginner's Guide to Building and Programming Robots | Free eBooks Download - EBOOKEE! Description: The LEGO MINDSTORMS EV3 Discovery Book is a complete beginner's guide to the EV3 kit from bestselling author and robotics expert Laurens Valk. This full color book teaches you fundamental programming and robotics skills as you build and program powerful robots that move, monitor sensors, and respond to their environments. You will build six increasingly sophisticated robots like THE SNATCH3R (an autonomous robotic arm) and LAVA R3X (a humanoid that walks and talks). Valk also covers more advanced programming techniques like data wires and variables, and shows you how to create custom remote control programs. More than 100 building and programming challenges throughout encourage you to think creatively and to apply what you've learned to invent your own robots. 2014-03-28The LEGO MINDSTORMS EV3 Laboratory Build, Program, and Experiment with Five Wicked Cool Robots! 2014-02-19The LEGO MINDSTORMS EV3 Laboratory Build, Program, and Experiment with Five Wicked Cool Robots! 2014-02-17The LEGO MINDSTORMS EV3 Laboratory: Build, Program, and Experiment with Five Wicked Cool Robots! 2014-02-15The LEGO MINDSTORMS EV3 Laboratory: Build, Program, and Experiment with Five Wicked Cool Robots! No comments for "[PDF] The LEGO MINDSTORMS EV3 Discovery Book: A Beginner's Guide to Building and Programming Robots".